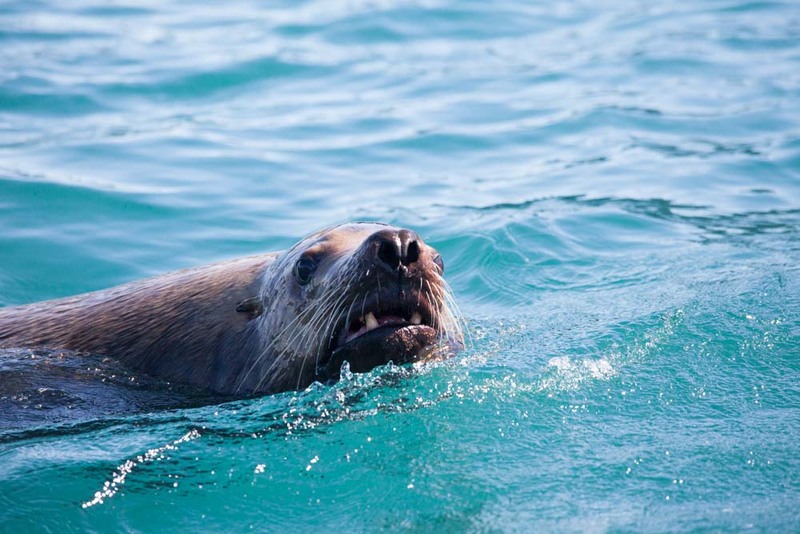 A Steller sea lion bares its teeth. Inside Passage, Alaska (photo: Quentin Long). Alaska’s Inside Passage is one of the coldest places on the earth, so it’s a surprise to find the abundance of wildlife that calls this place home. Here are Quentin Long’s faves, which he spotted cruising on Lindblad’s National Geographic Seabird. These animals have to eat 35 per cent of their entire body weight a day. To achieve this considerable task they will use a rock tucked into the folds of their fur to bash open shellfish or clams. And they’re great parents: they blow air into their young’s fur to make sure they are buoyant and can float while they go off and dive for food. This tiny bird (not related to our Australian wrens that I am reliably informed are not ‘true wrens’) has the most complex bird song in the world. In its nine-second song it hits more than 200 different notes. These birds look a bit like a flying penguin. What makes them peculiar is that they don’t build nests, but lay eggs on the cliff edge; their eggs have evolved a pointy shape to make them roll in tight circles so as to lessen the threat of rolling off a cliff. Even more astonishing is that the shell has tiny Velcro-like hooks that help to stabilise it on a precarious ledge. There are two species in the Inside Passage, the ‘Resident’ and ‘Transient’ or Bigg’s. The Resident eats mostly fish, has larger pods of about 20 to 30 with a complex language system that means different pods of Resident killer whales would not understand each other. The Bigg’s killer whales’ diet, meanwhile, is made up of sea mammals and the pod size is far smaller – about four to eight animals. They have a far simpler language system and do not vocalise very much. Not quite the largest star fish in the world, it is still pretty huge reaching one metre in diameter and can have up to 30 arms.